Mathew Tekulsky is the author of Backyard Bird Photography and that made me take a longer look at this book. Between my neighbor and myself, we stock our gardens with flowering plants and feeders for our hummingbirds. My neighbor takes incredible photos of these little powerhouses that are just so incredible; both the photos and the birds. There is nothing more thrilling than to be chased out of the garden by the humming wing beats of this magnificent creature who wants the garden to herself. We can watch, but at a little more distance, please. Hummingbirds are a ‘New World’ bird, among the smallest of birds, with a life space of about 5 years. There are over 330 species of this little gem with only about 26 species north of Mexico. The diversity and numbers of hummingbirds dramatically increases as you get closer to the equator. How wonderful to have even a few here in Western Massachusetts. They have prodigious memories and will return to the same nesting and nectar-gather sites year after year. Hummingbirds are also territorial, very protective of their nesting and feeding sites. Watching one chase a ‘rival’ is a sight to see. They feed on the nectar or ‘honey’ of our flowers and on insects that they catch in their becks. (Please, this is another reason not to use pesticides in our gardens). They summer with us and migrate great distances in the spring and fall to their winter territories. The breath taking photographs in this book are up-close and very personal. Even when a hummingbird is chasing you out of their way, you are never this close to be able to admire the iridescence and radiant colors of their feathers. Included in the Art of Hummingbird Gardening is a list of fifteen North American Garden Hummingbirds: description, range, favorite flowers, season, nesting, winter, migration route, habitats, and special features. Next is a list of cultivated plants for attracting Hummingbirds, followed by a list of native North American plants for attracting Hummingbirds. There is always something more to learn to conserve our hummingbird populations. Add more of their favorite plants to your garden and you will be rewarded by their continuing presence. 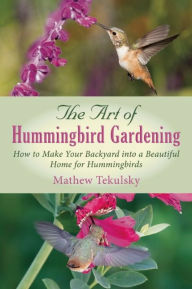 Mathew Tekulsky is the author of The Art of Butterfly Gardening and Backyard Bird Photography. His bird photographs have been displayed in galleries and museums, including the Roger Tory Peterson Institute. The Art of Hummingbird Gardening was published in 2015 by Skyhorse Publishing.